Gathering 37 talented trumpet players from prestigious musical schools like Julliard, Eastman and the Boston Conservatory for two weeks of collaboration would seem a recipe for musical perfection to most people. 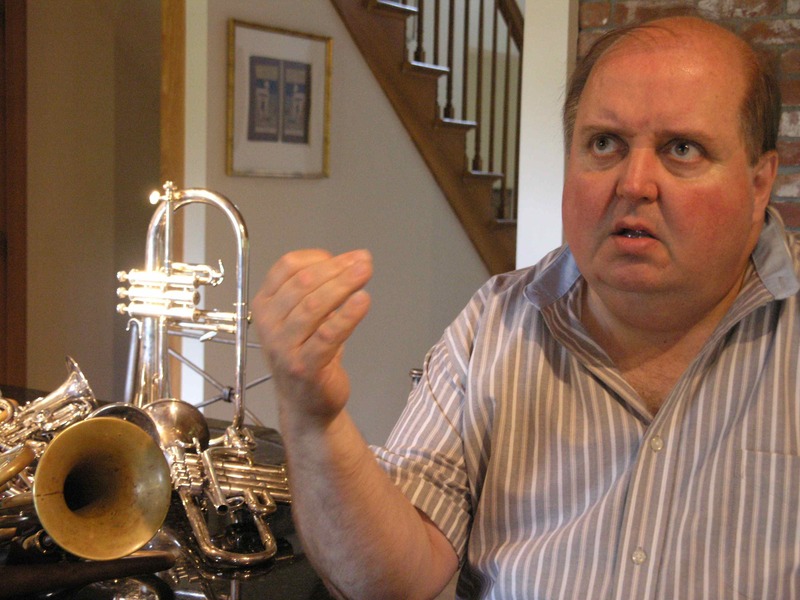 But not to Edward Carroll, director of the Chosen Vale International Trumpet Seminar, which begins June 16 at the Shaker Village Museum in Enfield. The seminar attracts talent from all over the world to focus on a single maxim – any piece of music, no matter how sublime, can be improved. Chosen Vale began as a response to overly structured curriculums at conservatories and academies that didn’t effectively address some students’ non-mainstream impulses. “We’re most interested in music that falls outside of the normal repertoire of the trumpet – romantic and early twentieth century music,” says Carroll. For sessions that typically run 12-14 hours a day, students work with experimental pieces, real-time composition and improvisation. Carroll, a gregarious man with expressive eyes, is obviously enamored by his subject. For the interview, he sits at the granite kitchen counter of his Hanover home; music emanates throughout the house. A room to his left holds a grand piano, with two boom microphones positioned in front of it. Downstairs, a music lesson is in progress. In front of Carroll sit 9 or 10 trumpets, a small sampling of the many horns in his collection. He’s spent a lifetime in music, playing with orchestras and chamber groups, teaching and recording. Chosen Vale is his creation, and though Carroll divides his time between teaching at Montreal’s McGill University and CalArts in Southern California, he chose to have the seminar in the town he’s called home in since 1992. Chosen Vale began in 2006, and was fully subscribed from the start, which Carroll credits to the seminar’s teachers, drawn from the best orchestras, music programs and chamber ensembles in the world. In the master classes, which are open for the public to observe, the instructors typically take “a piece that seems complete, and then tear it down and dissect it and find ways to tweak it and make it better and then put it back together again. That’s the heart and soul of the seminar – doing that kind of work,” says Carroll. He began Chosen Vale to focus the ensemble work he’d done at the Lake Placid Institute for the Arts, which he founded in 1996 and ran for 7 years, on the trumpet. As an example, Carroll spoke of one Lake Placid student’s difficulties accepting attempts to refine what was, by all accounts, a brilliant piece of music. The crestfallen girl responded that she couldn’t possibly do better. of favorite solo and ensemble works.